David Maltby was born on 10 May 1920 in Baldslow near Hastings, Sussex. His parents, Ettrick and Aileen Maltby had three children: Audrey, born in June 1915; David; and Jean, my mother, born in December 1924. He went to Marlborough College, leaving in 1936. In 1938, he decided that he wanted to train as a mining engineer, and went to work at Treeton colliery in South Yorkshire, boarding with a local family in the neighbouring village of Aughton. When the war started he tried to sign up for the RAF on 6 September 1939. At the same time so did tens of thousands of other young men. Most of them were told to go away and wait, and that they would be invited for assessment as soon as possible. Maltby was accepted for aircrew training in March 1940 and finally got his call up papers in June of that year. He qualified as a pilot on 18 January 1941 and in June was posted to RAF Coningsby, which was then the home of two squadrons, Nos 106 and 97. He flew his first six operations in 106 Squadron’s Hampdens, but was soon transferred to the new Avro Manchester aircraft, operated by 97 Squadron. This was the two-engined precursor of the formidable Lancaster, but it was notoriously underpowered and unreliable. However by January 1942, the new Lancasters were available (97 Squadron was only the second squadron in the whole RAF to get them) and he made his first trip as first pilot with a crew of his own. He took part in a number of famous operations, including two unsuccessful attempts to destroy the German battleship Tirpitz, which was concealed in a Norwegian fjord. He finished his first tour of operations in June 1942, and was awarded the DFC. He then spent a few months commanding a specialist Air Bomber Training Section in 1485 Target Towing and Gunnery Flight before returning to active operations with 97 Squadron, on 17 March 1943. He was given a new crew, all recently qualified from training: William Hatton, flight engineer, Vivian Nicholson, navigator, Antony Stone, wireless operator, John Fort, bomb aimer , and Austin Williams and Harold Simmonds, gunner. On 25 March, as a group, they were transferred to a new squadron, set up under the command of Guy Gibson, to prepare for a highly secret mission. Les Munro, Joe McCarthy and their crews were also transferred out of 97 Squadron the same day. Maltby’s crew flew on some 23 training flights over the next six weeks, with the only hiccough being in early May when front gunner Austin Williams was deemed unsuitable – the reason why is not known – and was replaced by a new gunner, hurriedly imported from 9 Squadron, Victor Hill. At 2147 on 16 May 1943, a group of three Lancasters, piloted by Melvin Young, David Maltby and David Shannon took off from Scampton. Maltby’s own flight is recorded in detail, thanks to the logsheet meticulously kept by his navigator, Vivian Nicholson, which notes that they arrived at the Möhne at 0026, having taken 2 hours 32 minutes. The first three attacks were not successful. To the onlookers circling the wood beyond the lake, the fourth, Melvin Young, seemed to have delivered his mine in textbook fashion, but still the dam wall held. Gibson told Maltby to go ahead at 0048. This time, three Lancasters ﬂew towards the target. Gibson on David’s starboard side, Martin over to port. Antony Stone checked the spinning mine, John Fort lay ﬂat on his stomach in the front fuselage, waiting, with Vic Hill’s feet planted in their stirrups over his head. As they came over the spit of land, Vivian Nicholson turned on the spotlights and peered out of the starboard blister at the beams, calling, ‘Down, down’ as their lights came closer and closer. Up in the cockpit, in the left-hand seat, David Maltby adjusted the height and kept the aircraft level while, next to him, Bill Hatton watched the speed and moved the throttles. As they approached the dam wall, Maltby suddenly realised that from this close he could see a small breach had occurred in the centre and that there was crumbling along the crown. Young’s mine had been successful after all! In a last second change of plan he veered slightly to port but stayed dead level as John Fort steadied himself to press the release. The mine bounced four times and struck the wall. Over the dam they ﬂew, now turning hard left, Harold Simmonds in the rear turret ﬁring on the gun emplacements that were still active. ‘Bomb dropped. Wizard.’ was what Vivian noted immediately in his log. The lake began to calm down again, and Shannon was called into the attack. As he readied himself, the circling crews realised, to great excitement, that the dam had been breached, and a torrent of water was pouring through. 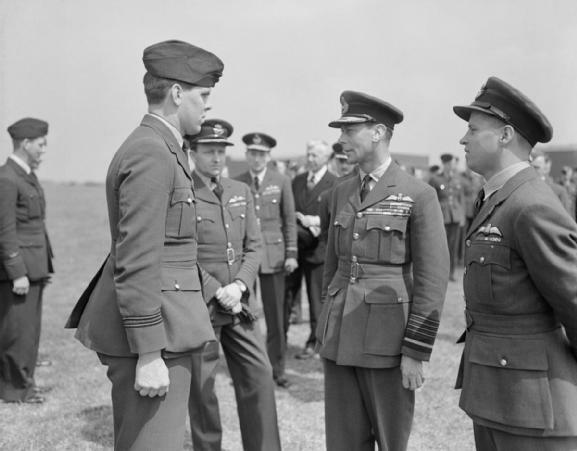 After the Dams Raid, for which he received the DSO, Maltby became commander of A Flight and often acted as CO in Gibson’s frequent absences on official duties. He took a full and active part in the many festivities that took place, often in conjunction with the squadron’s other party animals, such as Richard Trevor-Roper. As both of them had pregnant wives at home, perhaps this gave them a special bond. Party hard they might, but by September the squadron was back in training for another special mission, an attack on the Dortmund Ems canal, using a special thin case bomb three times the size of a normal 4000lb ‘cookie’. Eight aircraft were assigned – Maltby would lead the second group of four, himself, Dave Shannon, Geoff Rice and Bill Divall. Less than an hour into the flight, word was received at base that the weather conditions at the target had deteriorated. The aircraft were recalled. Then came disaster. As it turned, Maltby’s Lancaster suddenly exploded. Shannon stayed with the wreckage, sending fixes and circling above until launches arrived. It’s not clear what caused the explosion. It may have been pilot error. Something may have gone wwrong with the bomb. Or it may have been a collision with a 139 Squadron Mosquito, returning from a raid on Berlin but out of radio contact. The only body recovered was that of David Maltby. It was brought ashore, and he was buried the following Saturday in St Andrew’s Church, Wickhambreaux, Kent – the same church in which he had been married just sixteen months before.